There are times during the game that the need for depth is important. When a player is moving along the bye-line just inside the penalty area, over-eager to score, the attack rushes forward and usually flattens out. This movement leaves the shooter with only two choices, to shoot from a difficult angle or to center the ball, which gives the defense a good shot at intercepting it. Let’s take a look at a couple of attacking methods and a way to learn how to teach your players to add depth to your team’s attack. There are two major attacking methods, individual attack and collective (or team) attack. Individual attack consists of dribbling and shooting by one player. 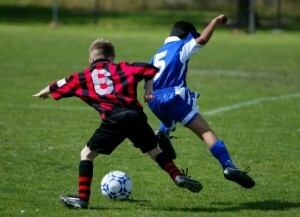 Team attacks are based on the ability to pass amongst teammates by kicking, heading and positioning to receive the ball. Soccer emphasizes the need for team attack because defenses have developed so well that they’ve limited most individual attacks. This doesn’t mean that there’s no longer any use for individual attack, though. For example, if a player takes on a defender by using a teammate as a decoy or a teammate runs to take the covering defender away, creating a one-against-one situa­tion, an individual is working within a collective attack. If an attack advances in a straight line, the only way in which the ball can be passed to another player’s feet is square, which is what most defenses expect. The purpose of positioning off the ball is to disrupt the defenders and to exploit the open spaces or to be able to draw away from an opponent. This form of positioning will give depth in attack. To give depth at least three players are required. For example, if the right wing has the ball, the center-forward should support him by making himself available in a forward position and the midfield player should support him from a slightly backward of square position. This means that the right wing has two passing possibilities and the three players form a triangular formation. With the quick movement of the game the nature of this triangle will change and may be pointing in any direction, but the flatter it becomes the less effec­tive it will be. This will increase the risk of the pass being intercepted. Here’s a great soccer drill to practice this. Have three players concen­trate on maintaining the triangle while move­ment is taking place. Confine the drill to a 15-yard square and introduce one defender. The idea here is for the two players off the ball not to be caught hiding behind the defender. If the ball is intercepted or goes outside the area, then the last player to have touched the ball changes positions with the defender. This practice should be the basis of your team’s posi­tioning technique, no matter if the players are kindergarten age or high school age. For experienced players, introduce another defender and enlarge the area so that you play three players against two defenders. The defenders switch with the offensive players when they have caused the three players to lose possession. The goal is to avoid flatness in attack and create more options. If your players realize the danger of being caught square to the man on the ball, you will add great depth to your team’s attack and hold possession longer, which is all-important in soccer.